As you know I'm a sucker for details. Small somethings that make a piece extra special. 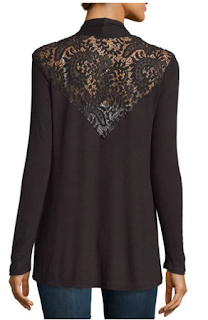 Today's detail is a lace back. Lace isn't just for summer. These sweaters are classic pieces that go with everything, but turnaround, it's a whole new game. See what I mean? A classic open front cardi, and then, BAM! Simple. Easy. Then something extra. A casual marl fabric is dressed up with a little gathering in the back and some lace. I'm showing the ivory option because it highlights the lace details on the screen, but I actually prefer the army green color. We are easing into sweater weather, why not have some fun with it? 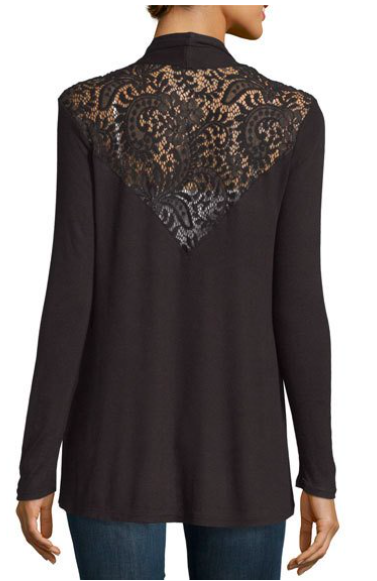 A little lace is perfect for fall.